Wow! This is a common question in my 8 years of clinical practice. Patients hear so much advertising from companies, recommendations from friends, and info on the internet that it becomes very hard for them to sort out all the conflicting information. I really try to make it easy for my patients giving them the following scenario when choosing a filler that is right for them. * There are 3 main things to consider when choosing a filler for lines, folds, wrinkles or volume. Now it’s simple right? Almost that easy but here is where we look at several other factors, most important of which, is what your doctor recommends based on the area you are choosing to enhance with a filler. Certain fillers are better for certain areas!! So here is my input based on the following credentials for making these recommendations. Serve as part of the educational faculty chosen by several of these large filler companies. I constantly attend the meetings and review the studies involving comparisons of the products. NOTE* I ONLY ( as most doctors ) give credibility to the studies that are done by independent physicians not paid by the large corporations who are selling the products themselves. This is an exciting new hyaluronic acid filler that is exclusively used for long lasting volume replacement in the mid cheek and cheekbone. The volume effects have a duration of up to 2 years! 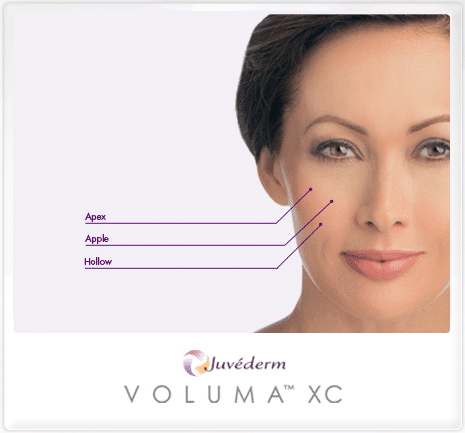 Whereas Juvederm XC is for lines, wrinkles, and folds, Voluma is entirely for building up hollow areas of fat and soft tissue loss. I lump these together because they are both called HA or Hyaluronic Acid fillers and they really are very similar (despite company claims and based on my patient feed back and experience). For every patient I have that prefers Restylane, I have one on the opposite side of the fence that prefers Juvederm. Both last 4-8 months…. But wait there’s more!! These fillers last longer and longer after repetitive injections over time. It is really quite amazing but here is my experience. 1st time 3-5 months but upon second and third injections we are then layering and the product can then remain visible and keep a patient very happy for up to a year. Uses: Lips, fine lines and wrinkles, bags under eyes. Lasts much longer. Patients generally are happy with the product for 1 year or longer so approximately 10-18 months on average. Uses: A thick viscous compound (more than Restylane or Juvederm) and therefore used for folds near nose, marionette lines, and VOLUME REPLACEMENT. In my opinion this product allows physicians to really augment and enhance the full face and achieve results of a liquid facelift. VOLUME is the key to youthfulness. Uses: We can use Radiesse all over the body! Including an amazing effect on the back of the hands. Not really a new compound. Was formulated for years as New Fill in Europe. A pure volume filler, not really used for filling wrinkles and folds. Therefore we often use this like we use Radiesse, for replacing volume or fat loss in the face. The initial water volume quickly disappears and then we wait about 1 month as these crystals build volume ( your body builds collagen around them) over the following month. So the process with Sculptra is: 1. Inject 2. Wait one month 3. Re-evaluate.